Reduce the appearance of wrinkles with this ultra-light gel serum. Power packed with an optimum dose of Juice Beauty's proprietary blend of fruit stem cells infused into a vitamin C, resveratrol rich grapeseed formula to boost and enhance skin tone and texture. Formulated to maximize the performance of the Stem Cellular Anti-Wrinkle Moisturizer by preparing the skin to absorb rich antioxidant benefits. 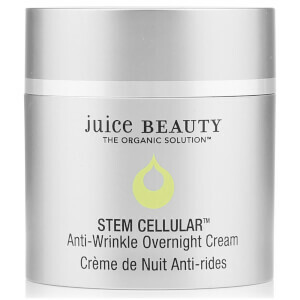 Juice Beauty's Stem Cellular Anti-Wrinkle Booster Serum is ideal for all skin types and especially beneficial for skin showing the signs of aging including fine lines, wrinkles and sun damage. Fights free radical skin damage and creates firmer-looking skin. Apply morning and evening to cleansed face, neck and decollete prior to applying Juice Beauty's Stem Cellular Repair Moisturizer and Stem Cellular Repair Eye Treatment. This product feels smooth and soothing on my skin. Non-greasy and non-sticky. I love feel and cooling aspect, love that it's cruelty-free. Have not seen any dramatic improvements on skin texture or wrinkles- but I hope this is at least preventing new damage. Love the scent, love the results, love the feel...........THE. BEST.PRODUCT.EVER!!! I am beyond pleased with BOTH this and the eye treatment I really am speechless.Most serums I've tried have a been runny and watery so I was surprised that this wasn't the same way. I applied this to one side of my face very easily and it absorbed quickly. I paid attention to my laugh line, my upper lip, and MY smile lines near my temple and outer eye. UM...we have a winner!!! My pores were not as noticeable, I wasn't sagging...basically, for me, this stuff did what it claimed after 1 usage. As with the eye treatment I felt my skin tightening within a few minutes of applying it. Can't wait to see how it does with continued and prolonged use. Since I'm a moron and forgot to purchase the moisturizer I can't speak to the effectiveness of both together, however, my nightime moisturizer (which is organic as well) appeared to work better with this. So now I wait for the moisturizer to arrive.... =(I love the smell of green apples but I didn't smell anything. For me this is bad, for others you may love this. But again, everyone's sniffer sniffs differently so don't get mad at me if you find it smells when I didn't. This product is everything I could ever want and more! I have noticeable improvements in my wrinkles just a few weeks! I really can see a difference and couldn't be happier! I can't wait to try Juice Beauty's other products! This product is everything I could ever want and more! I am able to see and feel noticeable improvements in just weeks! This product turns back signs of aging! It is amazing!